Do you want to cut your guitar practice time in half and improve faster? Are you ready to discover the keys to putting your guitar progress on steroids and send your development on the guitar through the room? Let me help you unlock the door to mastering the guitar skills that for years you’ve only dreamed of. Feel you could improve at much faster rate if only you knew HOW? Do stories of the top guitarists spending hours a day practicing freak you out? Do you feel bombarded with possibilities of what to practice to get good and not knowing what to work on? Ever have that nagging feeling that the new techniques you’re learning aren’t merging into your playing? Always feel like your ON when your being taught but lost and directionless when you try and practice on your own? I have been teaching people of all ages and backgrounds guitar for over 10 years. In this time I have learnt what does and doesnt work. I now want to help not just my personal students but you also to start making the progress on the guitar that you’ve always wanted. 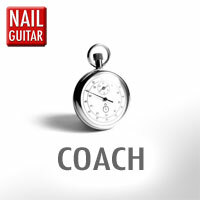 The release of Nail Guitar Coach is drawing near! To be the first to get a glimpse enter your name and email below.